The following scenes from Zorro had music replaced. Scene 9 song by Don Carlos (Misa Noeru) and servants. A performance of traditional Japanese dances, centering on the theme of "Wind". Reflecting the different facets of "Wind", this Japanese-style show gives the feeling of new life being breathed into tradition. The end of the 18th century. In California, in the "New World" of America, people suffer beneath Spanish despotism and hope their saviour will come. 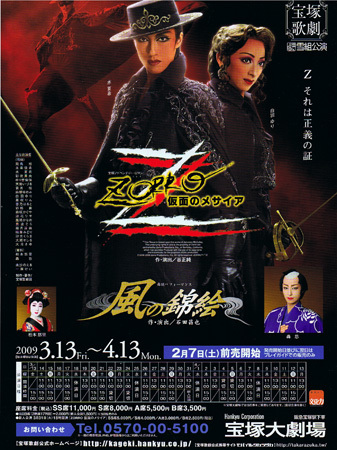 His face hidden by a black mask, his form disguised with a black cape, the legendary knight appears to punish evildoers as both Zorro and Lady Zorro. The deeds and loves of Zorro and Lady Zorro are portrayed in this swashbuckling play full of unrivaled delights. Final performance for top musumeyaku Shirahane Yuri, as well as Yurika Shiho, Tani Mizuse, Hozuki Haruna and Mariki Towa. Suzune Ryou will not be performing in both the Takarazuka and Tokyo runs due to poor health. She will also not perform in the shinjin kouen. Created by mizukusa. Last Modification: Sunday 04 of March, 2012 05:45:13 PST by taelle.